I think that everyone has that "one toy" that they always wanted as a kid but never got. A poll of my friends included things like an Easy-Bake Oven, Crossfire, a Transformer action figure, or the Millennium Falcon Lego set. For me it was the American Girl Doll. I was almost too old by the time I became aware of them, and they were ridiculously expensive (for a kid with a $5 a week allowance! ), and I already had tons of Barbies that I played with all the time. But I pored over the catalogs and the exquisitely detailed doll-sized antique furniture and accessories. I especially wanted pioneer girl Kirsten because of my obsession with Little House on the Prairie. And so I got one! 31 years old, mother of 3, and I bought myself a doll. There are stranger things, I guess! She's an American Girl #55 and I love her! As you can see from her home-made outfit, I've been making lots of doll clothes recently. It's fun and really quick. 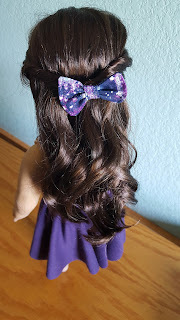 Expect to see a lot more doll clothes in the near future on here! The shirt I drafted myself based on the dress she came in. 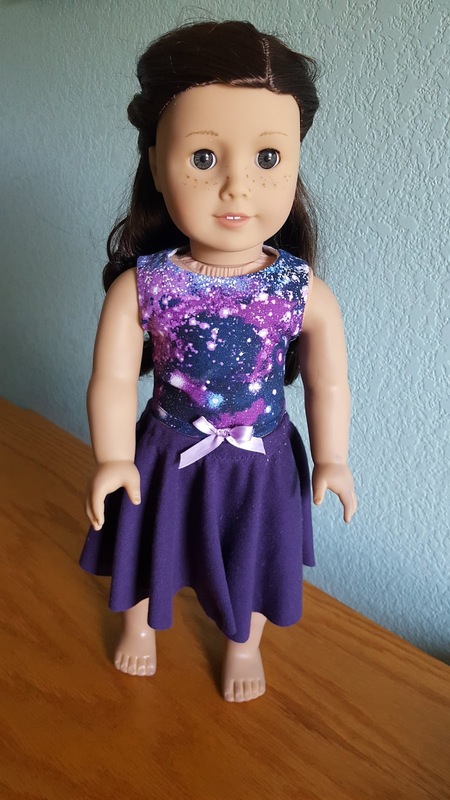 I bought a half yard of the fabric at Joann's and made a matching dress for Rosemary, which I will post when I get around to finishing putting the snaps up the back. The doll version fastens with velcro. The skirt is a purple knit circle skirt with an elastic waistband. And...yes, her legs are stained blue. I also made some skinny jeans for her and didn't prewash the fabric before trying them on her. Oops. At least now I don't have to worry about my kids "messing her up" haha! Both my youngest are fascinated by her--I'm considering buying another one for them to play with, a cheaper used one. I just love the way their little faces light up when they see her! I also found out that American Girl makes boy dolls now too, which could be fun. 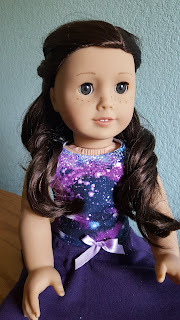 It's been fun looking for ideas in the American Girl facebook groups, and tempting to buy more stuff! All that cute little furniture and accessories! What was your "one toy" as a kid? Did you end up getting it as an adult? I think with Toys "R" Us going out of business, the nostalgia factor has been really strong for people my age lately.